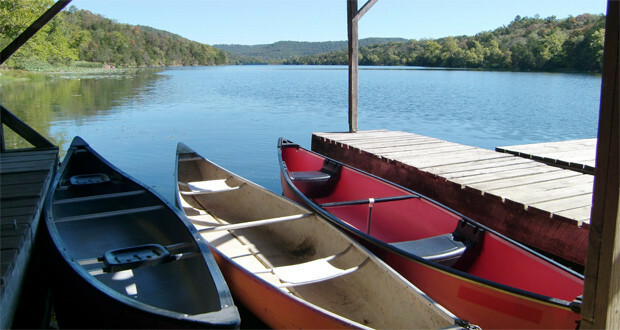 Lake Leatherwood Campground in Arkansas gives you the chance to relax by the lake while fishing or canoeing.Stay comfotable in one of their great shady campsites. Bruce gave us some insights on camping at Lake Leatherwood Campground, how he likes to spend his time in the park and what to do in Eureka Springs. I would take a short walk on our 25 miles of trails. We have an Eagle Scout candidate who’s project is to build a campsite on an island about 100 ft. from shore. The island camp will be easily our most popular campsite. This should be completed by March of next year. How long has Lake Leatherwood Campground been there and how did it start? Lake Leatherwood was originally conceived as a Works Progress Administration (WPA) project in 1939. The builders were known as the Civilian Conservation Corp (CCC). This was a program to put people to work after the depression and part of Roosevelt’s New Deal. The Lake served as flood control and for recreational purposes. The project took 5 years to complete. The hand cut, stone faced dam is one of the largest hand cut dams in the nation, the 1620 acre park makes Lake Leatherwood one of the largest City parks in the nation. The Park was given to the City of Eureka Springs in perpetuity as long as it remains a recreational area. The most popular activities in the park tend to involve the water. People enjoy going out Fishing. A lot of guests also enjoy canoeing and kayaking. For people who want to stay on land mountain biking is a popular activity. Where is Lake Leatherwood Campground located? What are some other attractions in the area worth checking out? Lake Leatherwood is located 2 1/2 miles west of Eureka Springs Arkansas. Eureka Springs is an artist community with beautiful Ozark scenery and historic Victorian architecture. There are world class restaurants, unique shops and historic hotels. The Great Passion Play draws tens of thousands of visitors each year. I especially enjoy the architecture and scenery. What type of campsites do you have? Are they more open or secluded? Most all of the campsites are secluded and take advantage of shade. There are also some cabins available from a standard two person to a family, 4 person cabin.